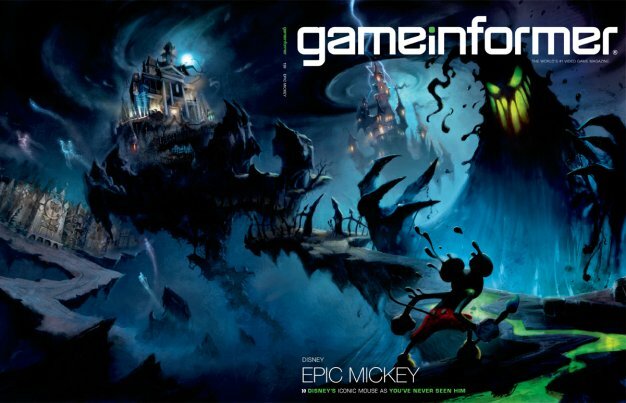 In all its creepy glory, may we present to you the cover of Game Informer‘s November issue, which will feature the official reveal of Junction Point and Disney Interactive Studios’ steampunk romp through a ruined Disney universe, Epic Mickey. The Warren Spector-helmed project has been the source of much speculation since the disturbingly dystopian concept sketches were first discovered several months ago, priming the hype pump with images of a crumbling Epcot dome, a foreboding Cinderella castle, a decaying zombie Goofy and a terrifying scorpion Country Bear. We’ll know more when the interview with the Deus Ex developer hits newsstands, but the image of Mickey brandishing a paintbrush seems to confirm rumors that the Wii-exclusive action title will have you “paint your way” through levels, as revealed by an anonymous informant back in July.